Why are coop revenues unstable? Take a look at that blue line for revenue — why is it so wavy? Our revenue largely comes from maintenance fees, which, until the end of the 2016 fiscal year, hadn’t changed in several years. Most of the rest of the revenue categories are similarly fixed year-to-year: commercial rent, laundry room income, and parking fees. So why the instability? That’s too bad — when you take all our predictable revenue and expenses, it looks like the coop is running a significant deficit every year. Over 13 years, that’s an accumulated deficit of over $46 million. Now in my old coop — a much smaller building in the west village — that would be the end of the story, and we’d be in big trouble. We did have additional revenue from flip tax, but we did not count that revenue in our operational budget because it was highly unpredictable. Some years it was a windfall that we put away into our reserve fund, but other years it was a big fat zero. But East River is much larger, and we have apartment sales every year. The flip tax from those sales is considerable — it’s our second largest revenue category — and has been built into our annual expectations, filling in the gap between operational revenue and expenses. Now we can see where the instability of our total arevenue comes from: it directly mirrors the instability of our flip tax revenue. 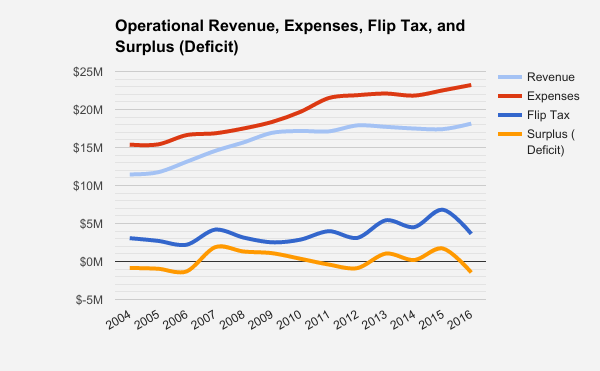 Even more clearly, the wavy line showing our surplus/deficit also rides the flip tax wave. It’s good to keep in mind that the health of the coop is directly related to the health of the real estate market, something we have little to no control over. *I haven’t included in this analysis the additional $10 million in debt the coop has acquired over the past 13 years. But that’s another story.